Digital POP displays are very effective. Studies show us that 65% of all in-store purchases are impulse buys. This means that last minute purchases are extremely common, and often happen while people are standing in line at check out. Taking advantage of this reality is what the POP display is all about. These simple displays are designed for the most eye-catching, attention-holding results possible. Digital POP displays that are designed by experts, trigger the shopper to make that impulse-to-buy decision while standing in line at the check out counter. More traditional digital pop displays will highlight the company logo, with images and text that are compelling while easy to read and comprehend. The text will highlight why you need the product, and how easily a problem is solved for a customer by choosing your product. Recent technology offers break-through methods that have made the multimedia wall display much more popular than before. This is because the multimedia display can host speakers and touch screens or a video screen for playing a loop that tells your company story in a manner that triggers a desire to purchase your product. Many even utilize motion-sensors so the media only begins to display when someone walks by the monitor. The digital pop displays offer sensors to trigger music, a video loop and/or verbal product descriptions or story lines. The better your design and marketing strategy, the more sales will be realized. Avante two decades of experience with designing and manufacturing every kind of in-store display imaginable means you can rest assured our experts will hit the perfect stride, delivering an image and design presentation that evokes the emotional purchase-response as quickly as possible. Two decades of experience have taught us that the biggest support we could provide to our customers is the lowest cost concept-to-completion display design and manufacturing possible. Environmentally sensitive, durable materials that really last are combined with award-winning design teams who deliver the most effective excellence. Our wall displays come with a proven anchoring system for stability and security. This is to be sure your multimedia player or video screen is not stolen or broken. 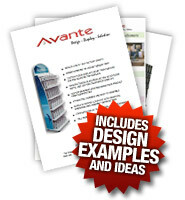 Avante will ship your wall display and multimedia player directly to the store, which minimizes any wait time. We will deliver and assemble the design you ordered in a package with the advertising player, your logo and a 3-D profile. It all arrives in a single package for additional savings and piece of mind. If you are new to multimedia wall displays we will show you how to use your video, how to mount it safely for maximum impact and provide it all at a minimum investment. For a low cost, you can have your specially-designed wall presentations secured safely on a wall or countertop using our custom anchoring system. By using interactive features such as video, multimedia or even touch screen you can tell your brand’s story quickly and efficiently. This is so you can leave an emotional impact on your potential customers before they walk out the door. Digital POP displays can include compelling details such as motion sensors. Sensors will trigger music or a voice speaking to customers as they start to walk by. This gets them to stop, listen to your message and watch the video giving you the chance to show how your product can improve their lives. Our displays are designed to carry product when needed, or simply unfold your brand messaging through the automatic interactive video player. Advertising players are a major benefit for POP displays; your display can include a specially crafted 3-D image of your logo for clear brand identification. First your 3D logo captures attention, next the multimedia messaging uses the video screen to convey complex ideas over built-in speakers for simple, quick emotionally-impacting messaging. We give you an SD memory card, then transfer all media to the card for installation. Our video cards are 100% tested before shipping to guarantee the player works immediately out of the box. Display and players are packaged together for even greater ease and lower cost. By creating a whole package that tells the story of your brand customers become attracted to your product and want to know more. Decades of delivering POP displays, then multimedia players have inspired us to focus our award-winning designers on fully-integrating these approaches into effective, impacting and attractive units. Call your Avante representative today to find out how your company will benefit from state-of-the-art Digital POP Displays with Integrated Multimedia Signage. We will provide you with a complete package that tells and shows the compelling story of your brand in the place customers are most likely to immediately buy it.